I Hold In My Hand The Last Envelope! What’s in the crypt of the star of “The Wizard of Oz”? Posted by Ted on October 8, 2012, 2:27 AM. 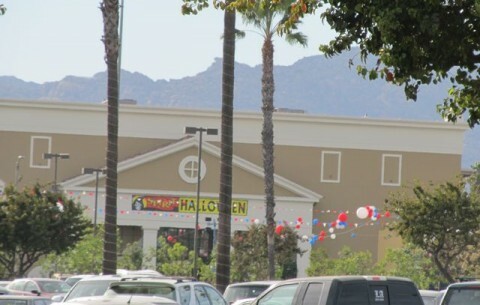 Remember How I Mentioned The Twelve Temporary Halloween Stores in My Neighborhood? My mistake! I meant thirteen. Note that I have circled something in the distance, in the left of the photo. 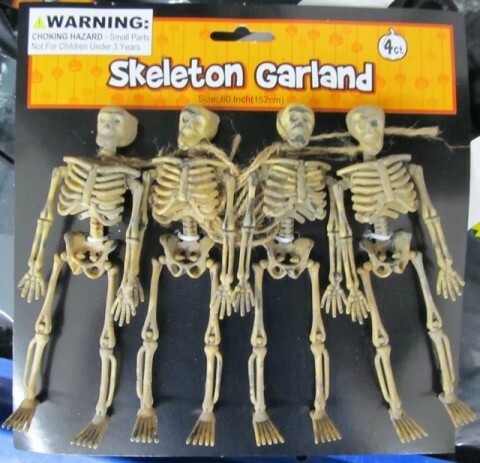 …another Halloween store! 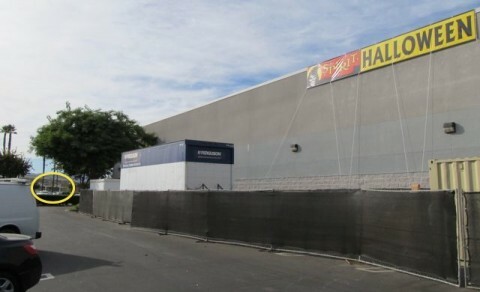 And we’re not talking two competing temporary Halloween stores! 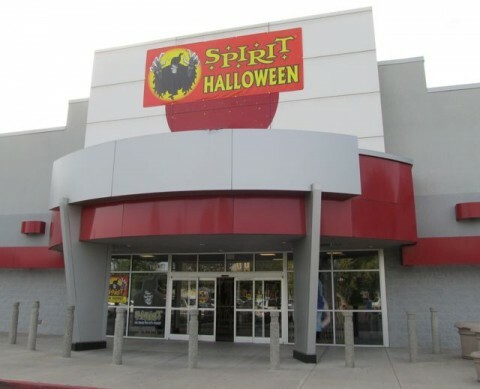 They’re both Spirit Halloween stores! In the same shopping center! A few hundred yards apart! So if you forget something for your costume at the first store, and don’t want to drive (or, God forbid, walk) all the way back there, you can just go to the second store! Posted by Ted on October 7, 2012, 10:40 AM. 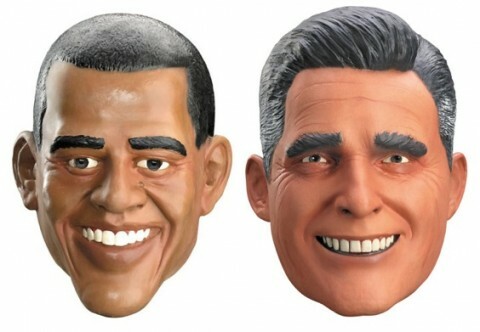 These are kind of vaguely creepy, right? Or is it just me? 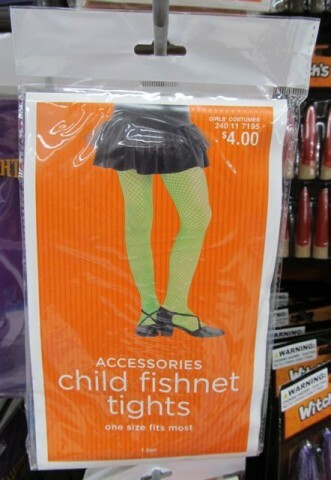 I mean, we all know I’m vaguely creepy, but I’m talking about the “child fishnet tights” here. Call me old fashioned, but it just seems that they’re kind of inappropriate for a little girl to wear. But it’s cool if I wear them, right? Posted by Ted on , 10:05 AM. …and talk about flashbacks! It was like I was in Virginia again! Only the ones back there are much bigger. Posted by Ted on October 5, 2012, 1:10 AM. 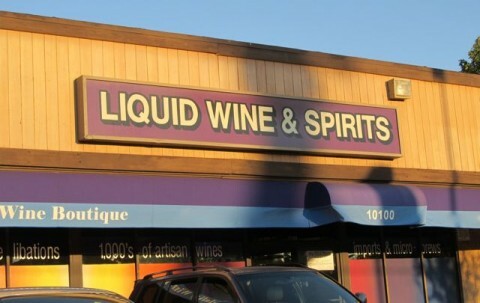 I’m So Glad I Found This Place! I can’t tell you how sick I am of trying to relax with a glass of merlot that I have to chew like a piece of overcooked calamari. Posted by Ted on October 2, 2012, 12:24 AM. Delightfully Anachronistic Packaging! 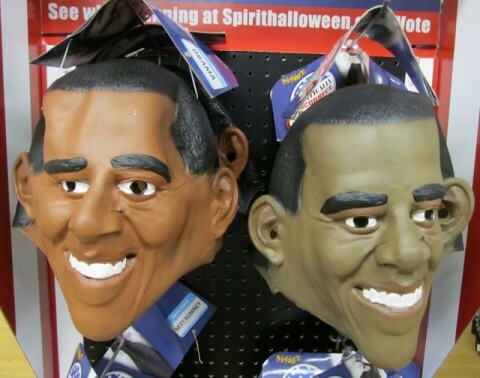 Halloween Edition! 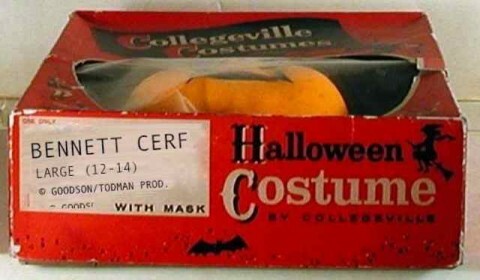 ON HALLOWEEN when I was seven, I went trick-or-treating as, of course, Bennett Cerf. 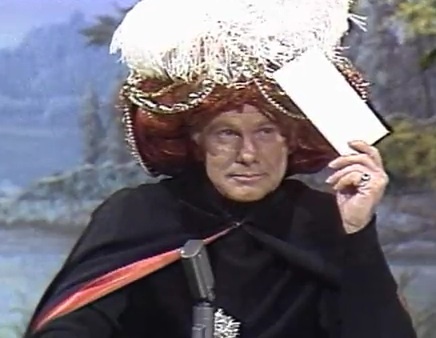 I’d hoped to dress as Mr. Cerf the year before, but the five and ten had quickly sold out of his costume and the closest thing available was his “What’s My Line?” co-panelist Dorothy Kilgallen (with inexplicable day-glo yellow molded “hair”). Mother – not an artist! 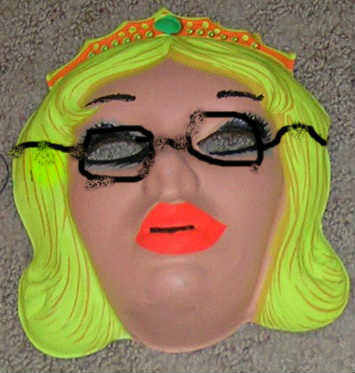 – tried to transform her into Bennett by drawing eyeglasses on the mask with a laundry marker. Everyone whose doorbell I rang asked me where Yoko was. 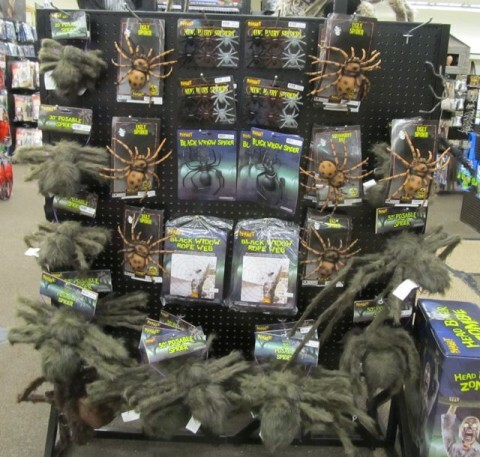 That next year I made sure to get to the store the first day of October to buy my Cerf costume. Unfortunately, Woolworth’s buyer only ordered the large size, for the big boys, but I was bound and determined to go as my favorite television personality. Grandmother pitched in and hemmed the legs of the costume so I wouldn’t trip, but the mask was a different story – it really couldn’t be trimmed down without rendering unrecognizable the likeness of America’s leading publisher and compilator of puns. The plastic mask was much too big and sat awkwardly on my face. Instead of looking out both of the eyeholes, I was struggling to peer through one nostril, or if it shifted, the bowl of his signature pipe. I guess I couldn’t see where I was going when, giddy on SweeTarts and Mary Janes, I darted out between two parked cars on Gate Field Drive. Some jackass in a Plymouth Duster plowed right into me, literally knocking me out of my PRO-Keds (which was fine, really – Bennett Cerf didn’t wear those either). Doctors said the ensuing concussion plus some viral thing I developed from my walking pneumonia (no jacket, remember?) short circuited something in my brain and accounted for my sudden obsession with delightfully anachronistic packaging – which lucky for all of us continues to this day. 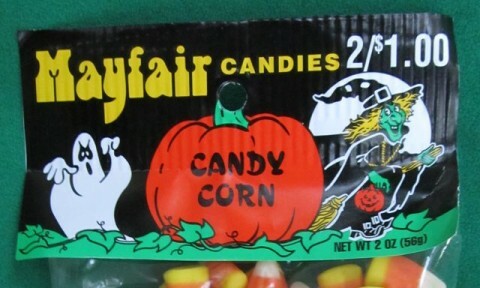 Above: Mayfair brand candy corn. Oh boy, two ounces – can they spare it? But look at the hang tag (industry term). It totally has a 1970s look to it, right? Check out the typefaces, the style of illustration, and the colors! It’s like it’s all right out of the glorious 1970s, right? 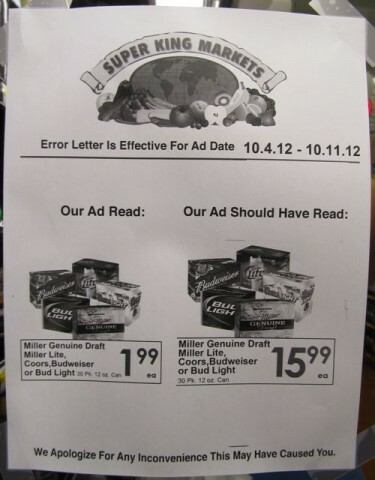 And yet you can buy this, right now, today, in October, 2012, at the store. It’s not as though they tried to make it look old – you and me, we can always spot those guys a mile away, can’t we? Such packaging just rings hollow and insincere. 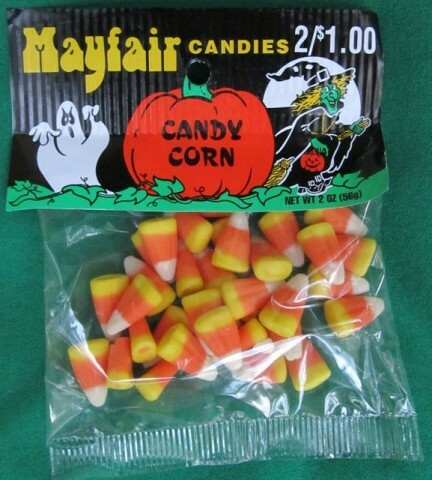 But not Mayfair Candies candy corn. This is the real deal. I reckon this is how they’ve been selling their candy corn since the Ford administration – back when tragedy, and a car, struck a young boy, shattering his hopes and dreams and pelvis. Worst of all, by the time I came out of the coma, my sister had eaten all my candy. Posted by Ted on October 1, 2012, 2:13 AM.